Following the sale of his Port Pirie Standard, Charles Chandler moved to Adelaide and in 1893 with compositor John Morris, established the short-lived Eagle newspaper. The suburbs covered include: Kensington, Bowden, Henley Park, Thebarton, Tea Tree Gully, Hope Valley, Stepney, St Peters, North Adelaide, Kent Town, Norwood, Marryatville, Brompton, Magill, Hindmarsh, Paradise, Fifth Creek, Payneham, Ridleyton, Maylands, Dry Creek and the city. Only three issues of the newspaper are known to have survived. 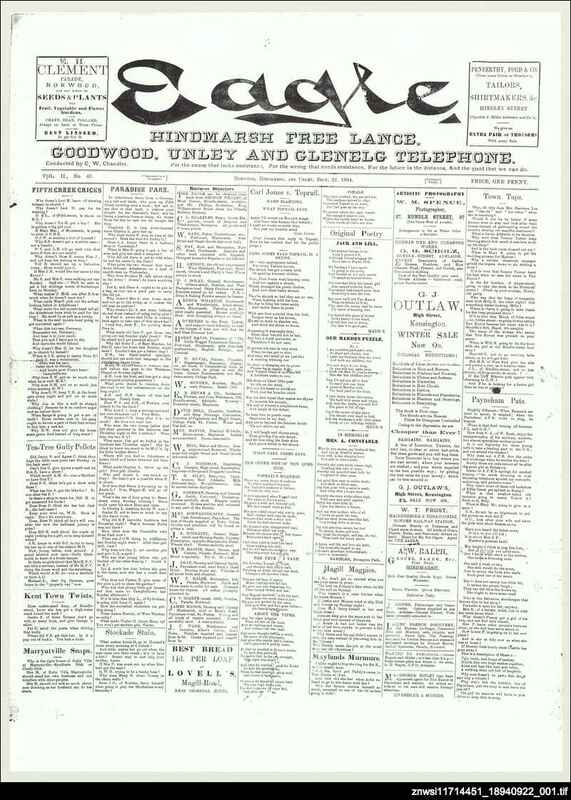 The bulk of each issue is taken up by columns covering various suburbs, using such headings as 'Kensington Kinks', 'Bowden Boulders' and 'Croydon Crows'. The single line entries under each heading are pure gossip. 'It would be better for Mrs C.L. of Little William Street, to go back to her husband,' or 'How did Maggie M. like that smack in the head she got from big Mary M. of East Parade?' (15 September 1894, p. 1) These were apparently compiled by 'correspondents' in each of the suburbs mentioned. It is difficult to see how the publishers got away with publishing such intimate and libellous material. Later Chandler ran the Adelaide Truth, and this had a Port Pirie edition which charged sixpence for individuals to insert these single liners. The Eagle probably operated in a similar way.